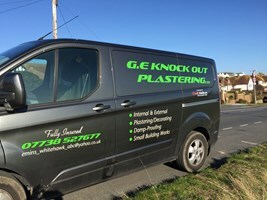 G.E Knock Out Plastering & Decorating - Painter/Decorator, Plasterer based in Saltdean, East Sussex. Welcome to G.E Knock out Plastering and Painting and Decorating Services. We are a small local firm with over 38 years’ experience in all types of Plastering, Painting and Decorating. We do both inside and out to a high standard and we are clean and tidy. We try our best to satisfy our customers. We do both domestic and commercial work and provide free estimates. We are always clean, tidy and on time as we know how important this is to our customers. Please give our friendly and helpful team a call.